Another sketch from The Sweetest Thing... I love the simplicity of this sketch. I've been working this card out in my head since I first saw the sketch on Sunday. I thought I would get a jump start on Father's Day - why not? :) And Loads of Love is my "go to" set for masculine cards. I'm trying to use up some of my Baja Breese designer paper - I seem to have a lot of it. I also whipped out my Chit Chat rub-ons for the sentiment. 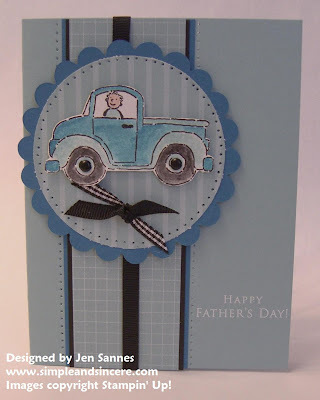 I love this - the paper piercing is fantastic and the colors are perfect for a Father's Day card. Thanks for playing along! You are the master of masculine cards! Great job!